37003 is being prepared for a "Special Event" this coming Friday 6th July, and for those of you that are watching on Facebook, Twitter or Loco Progress she will be doing this back in BR blue. As for the nature of the "Special Event".... well, now that all the bits have arrived safely in Norfolk to make this event possible, we can at last make this official announcement. 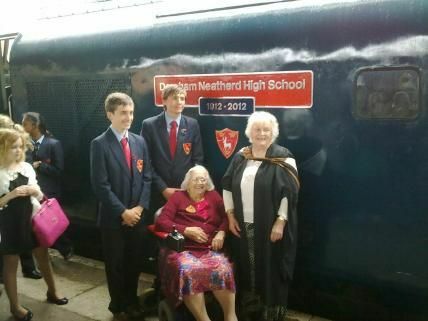 "Dereham Neatherd High School, 1912 - 2012"
She will carry these plates for twelve months as part of the school's centenary year. We were honoured to be asked to do this for the school, and is testament to the groups prominent presence at the Mid Norfolk Railway and now within the local community. 37003 plus vac set plus a.n.other loco as train ( 2 x TSO, 1 x BSO and FK). Naming at 1400, runs to Thuxton only where the other loco draws the train back to Dereham. NO spare seats I'm afraid as its a private charter.